I bought some pre-packaged crazy quilt supplies a while back… two coordinated grab bags of fabric scraps, ribbons, sequins and beads. So pretty, so tantalizing! I’m having fun giving crazy quilting a try but finally had to give in to my organizing compulsion. A bag of mixed beads?! 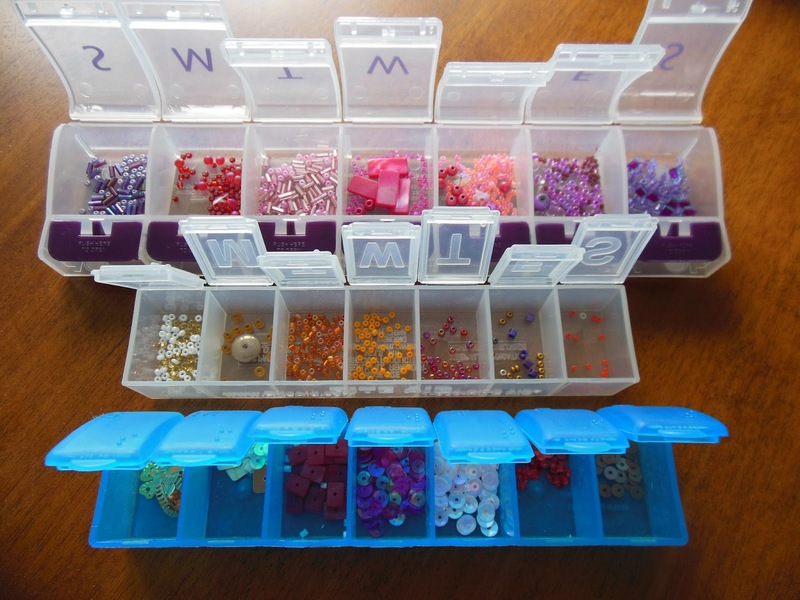 What if I need 30 tiny lilac beads and find only 20? I know, I know – really?! … I can be hard to take sometimes. Using daily pill containers purchased from the pharmacy was the perfect solution; tiny individual compartments all attached together. I chose the 7 day configuration but they come in different sizes and varieties. My Dad even gave me a couple of blue ones he had at home but I found they made the bead colors hard to ‘read’. Thanks anyway, Dad! All lined up, nice and orderly!